Why is it sometimes this way out outstate street fairs/festivals? 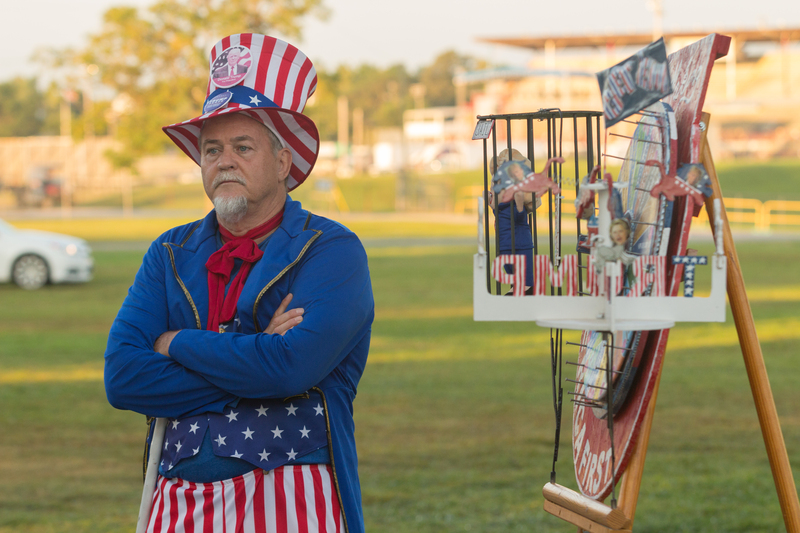 A GOP “shooting gallery” manned by an Uncle Sam at the Holden, Mo., Street Fair has some people concerned…. 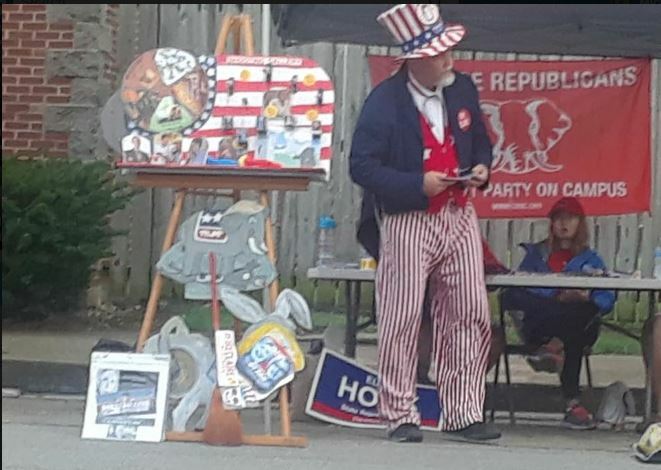 Not to put too fine a point on it, yesterday an individual dressed up as Uncle Sam set up shop with a representation of shooting gallery, complete with a toy gun, made up of photos of Democrats – this next to a republican college student group booth at the Holden, Missouri fair. Of course, either intentionally or randomly, who knows, the fair organizers had placed the Johnson County Democrats booth directly across from the republican booth. People took pictures and then posted them on social media. Small town Missouri racism. Booth selling KKK/ Confederate flags with no US flags for sale or present. The US flag in the picture is the booth next door. You do not get to pick your neighbors. GOP had a “game ” toy gun and a Shooting Gallery with Senators pictures on it. Great Family Fun shooting at Senators. 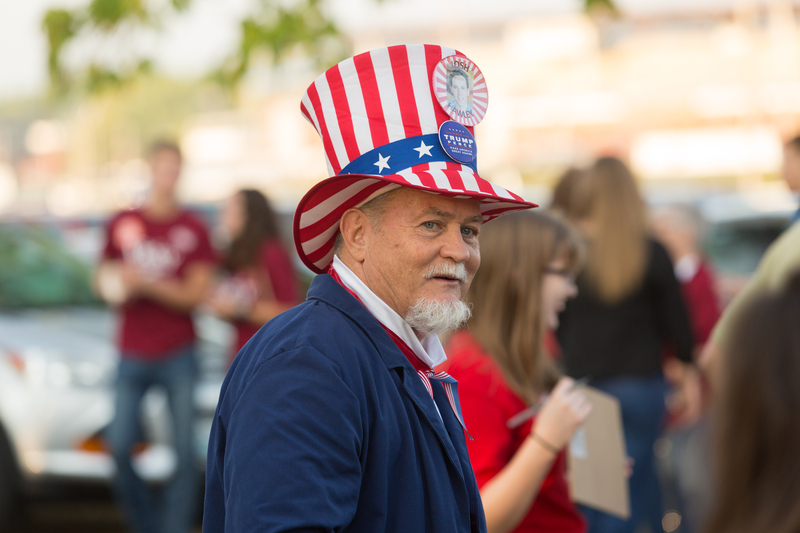 Raymond James is a Johnson County Democrat who was manning the Democratic party both at the fair. The flag vendor booth was another booth which was in close proximity to the other booths. In case you’re not convinced, the shooting gallery is labeled “shooting gallery”. We’ve seen this individual at public events before. Outside the Missouri State Fair Governor’s Ham Breakfast [August 2016 file photo]. Outside the Missouri State Fair Governor’s Ham Breakfast [August 2018 file photo]. In addition to the newspaper coverage we’ve heard that a Kansas City metro market television station sent a crew to the fair today. In an interesting turn of events, demonstrating brilliant public relations and damage control strategies, the street fair authorities have apparently issued an edict of “a plague on both your houses” and booted the Democrats and republicans from the fair. Don’t you just love small town Missouri? This post is from Ray James Chair Johnson County Central Committee. As previously posted, the Holden Chamber of Commerce asked the Democratic Booth to leave at the same time as the Republican Booth from the Holden Fair Tonight. We did not ask or discuss reasons why. We packed up when told to do so and left. We were told we may still participate in the parade 5 pm Saturday. At this time we are considering it. I will post by 2 pm Saturday if we will participate. For those scheduled to staff the booth I thank you for your time. Any questions or concerns about the actions of the Holden Chamber of Commerce Fair Committee and what / how they reached a decision should be directed to them. Remember they put in long hours to put on a fair in a very thankless job. There was no yelling, name calling, heckling, interference by Democrats staffing the booth with any other booths at the fair. We did not complain to the Fair organizers, Holden Police or the staff at the Republican booth about any actions by any booths at the fair. We did notify the Johnson County Republican Central Committee, Congresswoman Vicky Hartzler staff, Secretary of State [Attorney General] Josh Hawleys campaign staff of the unacceptable actions of the Republicans at the booth with their having a Shooting Gallery “Game” complete with Targets of US Senator Claire McCaskill and a toy gun. Tonight the game was renamed as the words Shooting Gallery were replaced and the toy guns were not present. I did not see if the pictures had been changed. The Gentleman who brought the “game” was again in attendance. Interestingly he brought an American Flag and insisted he had one present on the 23 Aug. I refer you to the pictures posted from the 23 Aug. The Gentleman clearly has memory issues or was untruthful on this issue. I was contacted by several media organizations and did give two interviews between 3:30 and 4:00 pm to Channel 5 and Channel 41. In which, I stressed the unacceptable actions of the Johnson County Central Committee Sponsored Booth. It is never OK to Joke about shooting a person or to encourage others to actually commit violence. As to the intent of the “game ” I would direct all questions to the Johnson County Central Committee as it was their booth. Any further questions by Johnson County Democratic Club members or Central Committee members please contact Ray James. The CC does not intend to issue a press release or to contact media concerning this matter but we do anticipate further media interest. I have referred all questions, as to why we had to suspend operations, from media organizations back to the organizers of the Fair as we did not discuss/ask.